This was my first real mostly-from-scratch woodworking project. I made lots of mistakes and bad design decisions, but I’m still proud of it. 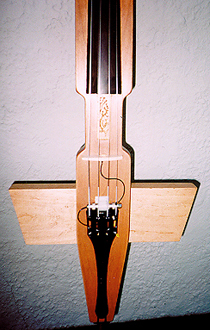 The body is about 42 inches long from the top of the headstock to the lower end, more or less like a full-size acoustic cello. The two maple crosspieces behind the body do a mediocre job of simulating a real cello when you sit in a chair and play it – the bottom piece is a too heavy, but it gets the job done. The endpin is real cello endpin threaded through the bottom crosspiece and held in place by a keyed screw. The fingerboard is ebony (I bought it premade), and the black goblet-shaped thing at the bottom is a metal cello tailpiece. All the parts came from the same places the viola parts came from (see viola #1), for about the same prices, except for the tuners, which cost more because they’re bass guitar tuners. The body, neck, and headstock are carved from a single piece of alder. I’d seen alder body blanks for electric guitars, and they were hard as rocks, so I went out and got an alder board figuring that alder just came that way. Near as I can figure, alder body blanks must be treated with something. I discovered that although alder is close-grained and sturdy, it’s a little too soft and scratches easily. I arrived at this conclusion when I was almost done carving the body, so I just went ahead with it because I was in too deep to chuck it. Another problem with untreated alder is its acoustic properties: it seems to either dampen higher frequencies or amplify lower ones – I can’t tell which. Of course, I didn’t discover this until I had the whole thing together and popped on the transducer. The tone isn’t bad, but the high end needs assistance from a preamp to sound right. The neck heel (where the neck flares out to meet the body) is carved to mimic the neck heel of a standard cello. For violin-family instruments, you know the neck heel is shaped properly if you can place your thumb in it, your index finger directly over it on the fingerboard, and play a perfect fifth above the open string. Of course, bridge placement is also a factor, but it’s easier to place the bridge properly if you’ve done the neck heel correctly). This instrument, I’m happy to say, satisfies the perfect-fifth requirement. It’s hard to tell from the photos, but the headstock is angled back to provide tension for the strings where they sit in the nut grooves. I carved the nut from a block of ebony. The tuners are mounted on the headstock so that they will point away from the player’s (in other words, my) head (I’m a southpaw but I still play right-handed). Having machine tuners for a cello is great, because you don’t have to mess around with pegs. The bottom photo shows the body up close. The ornamented rectangular thing below the fingerboard is actually there to cover up a big gouge I made in the body with a chisel. The bridge is cut from a thin maple board – I couldn’t use a standard cello bridge because the fingerboard sits so low. The transducer is fastened to the metal tailpiece to reduce ground hum (a persistent problem for Fishman cello transucers), and the black wire from the transducer is connected to folded piece of copper inserted in a small tab in the bridge (see viola #1 for more on transducers). If I had it to do again, I’d mount the back crosspiece lower (and make it less bulky), so that there is less endpin sticking out. At some point, I’m going to saw off most of that top stablilizer backpiece, because most of it is unnecessary. Once again, live and learn.